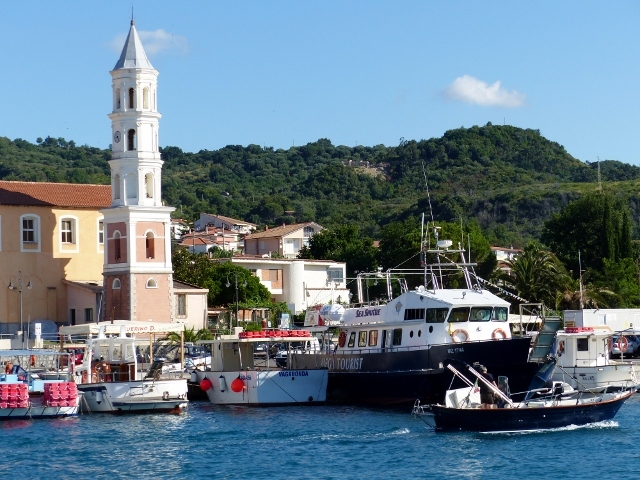 We motored into the Gulf of Policastro and into the Marina di Scario, a small but charming town built around the harbour. Scario, the church bells ring every quarter hour all night long. 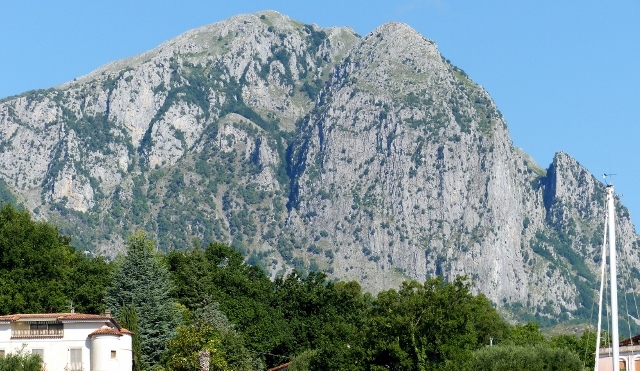 Behind the small town are mountains and the Cilento. Trees are green and lush and there are flowers everywhere. From the yacht, sailing in Gulf of Policastro. We had a quiet day wandering around the town, after a swim on the way over. We were enchanted by a puppy two yachts down, being trained by his Italian skipper. 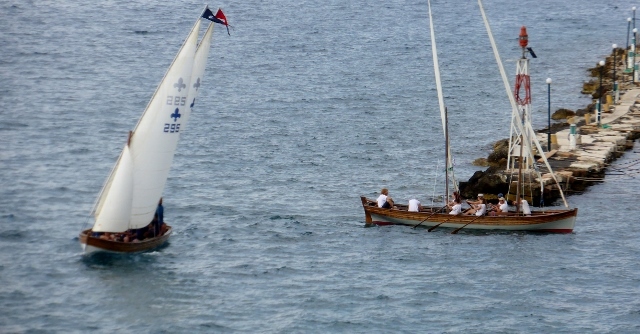 The skipper would use a squeak dog to call the puppy and offer a treat if he could get up on the passarelle by himself. This passarelle is set fairly high, so it was good work. 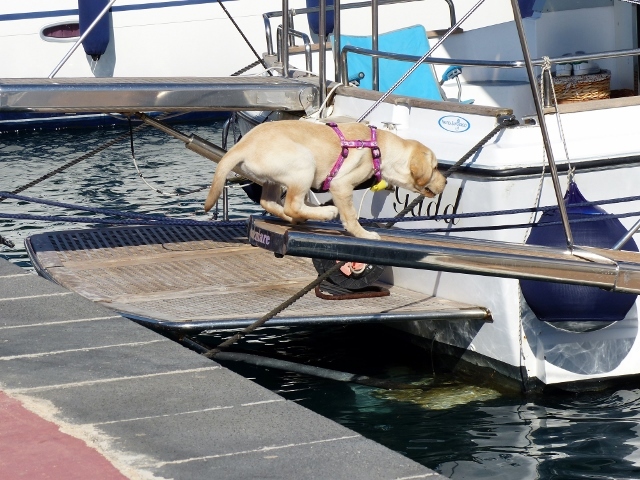 Marina di Scario, puppy learning to use the passarelle. The highlight of the morning was getting to the Baie degli Infreschi, which is a beautiful bay in the Cilento and Valley of Diana National Park. No roads in, only hiking in or coming in by boat. We were happy we arrived early, because we had the bay to ourselves with just a few boats until noon. 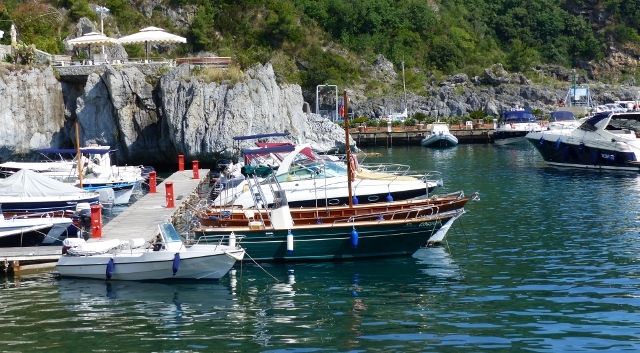 Pick up a mooring and enjoy! Then the boats arrived, like a swarm of mosquitoes. We found out that if a boat wants to come alongside and also use the mooring, then you have to welcome them alongside. We had a motor launch with a lovely Italian man and his wife that used her hands until we realised it wasn’t an option. We sailed into small harbours along the Calabrian Coast, finally arriving at the captivating and picturesque town of Maratea, Basilicata. 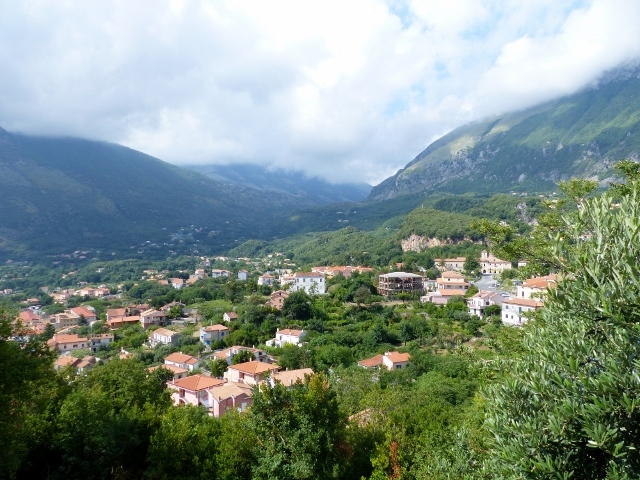 It is two towns in one, Maratea marina, which is the area near the sea and about three kilometers straight up finds the hilltop village of Maratea. We arrived in time for a wonderful lunch at Clubbino, best panini in Italy so far with a very friendly proprietor and staff. 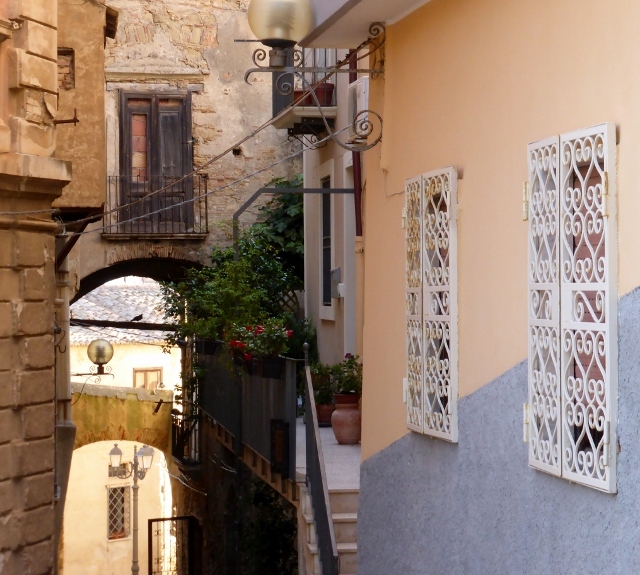 Then we walked around the area and found a spring of beautiful water which supplies the town, gargantuan caper plants cascading down stone walls and several restaurants. I led the charge on a path to the north of town, passing small mansions along the coast, but Frosty said let’s go down this little lane and it took us to a paved path along the sea. We followed it back towards the Marina and it ended in a rock pool, which looked very old and very weather-beaten, but surrounded by ladies lying on the flat rock platforms or boulders along the path. After siesta, we decided to wait for the bus to go up to the hilltop village. The bus never came and the friendly proprietor of Clubbino found a ride for us, as there were no taxis around either. The old town was beautiful and still at siesta, but we wandered around and took copious photos and called a taxi to go back down. 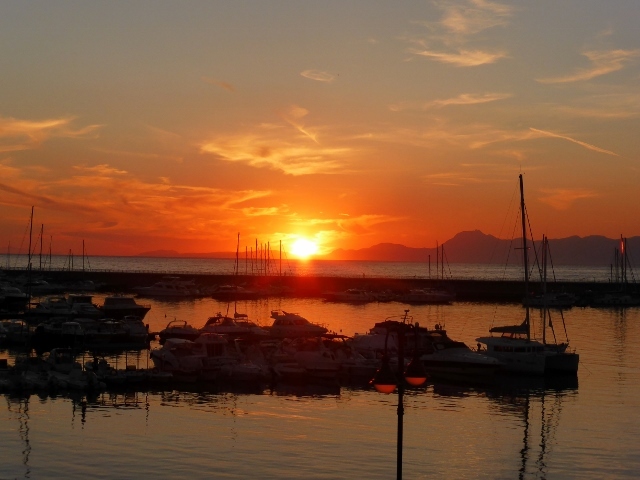 Two years ago, we sailed from the Aeolian Islands through the Messina Straits going south. 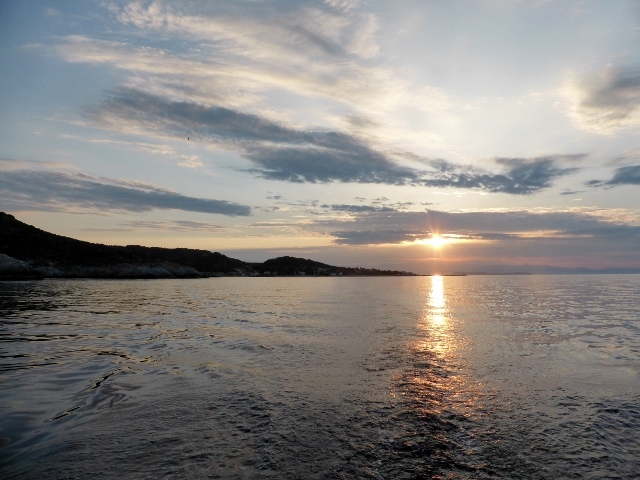 This morning at 6:30am we sailed the straits going north, sailing from Reggio to Tropea. 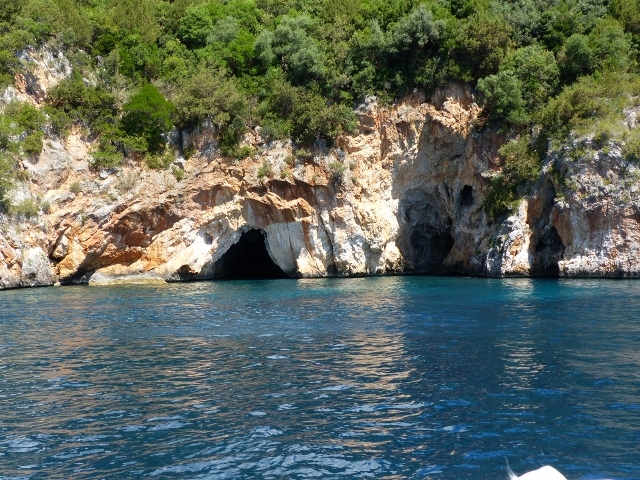 The Strait is 20 miles long and from 2 to 10 miles wide, funneling the Ionian Sea into the Tyrrhenian Sea and vice versa. You are able to see the energy in the water. look long enough and you are bound to see a whirlpool forming. We began so early because we knew the current would be flowing south by 7:30am, 4.5 hours after high tide in Gibraltar. Frosty was a bit skeptical at being underway by 6:30 am, even with a Nespresso in his hand but soon we were surrounded by the ‘passarelles’ or felucas, for the swordfish fisherman. Watching them move towards a sword fish at a rate of knots is quite startling. 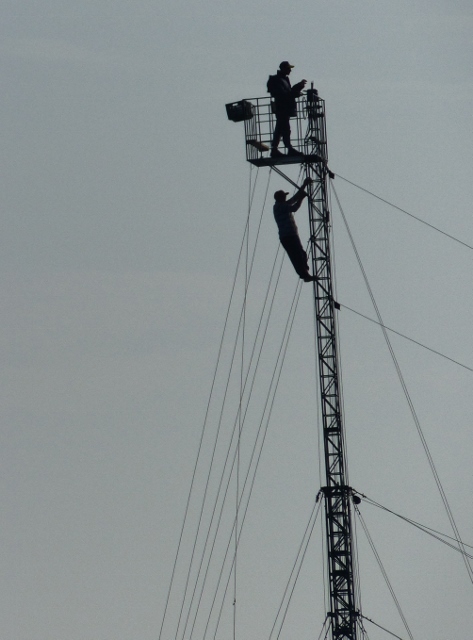 The boats are about 40 feet long and the mast is about 50 feet high and the skipper steers from that lofty position. The harpooner walking out on the passarelle. Look at the rooster tail. 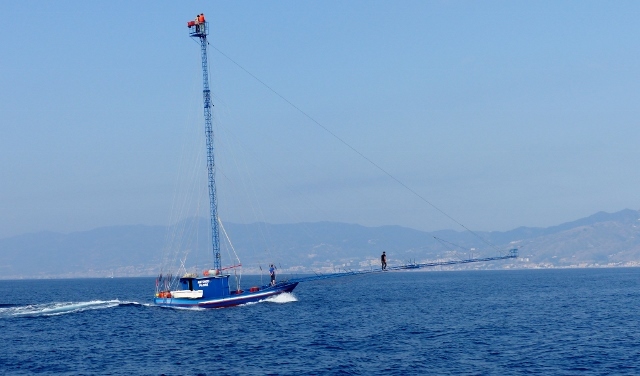 After getting through the Messina Straits with a sighting of one swordfish( or was it a tuna? ), a slight whirlpool trying to form and quite a bit of current. 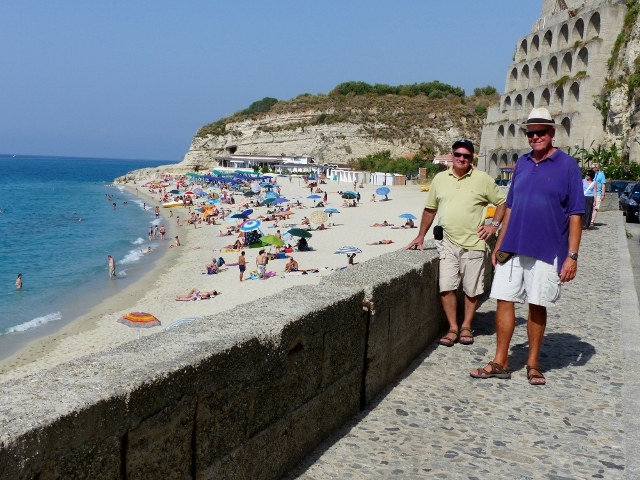 We sailed up the coast to Porto di Tropea. 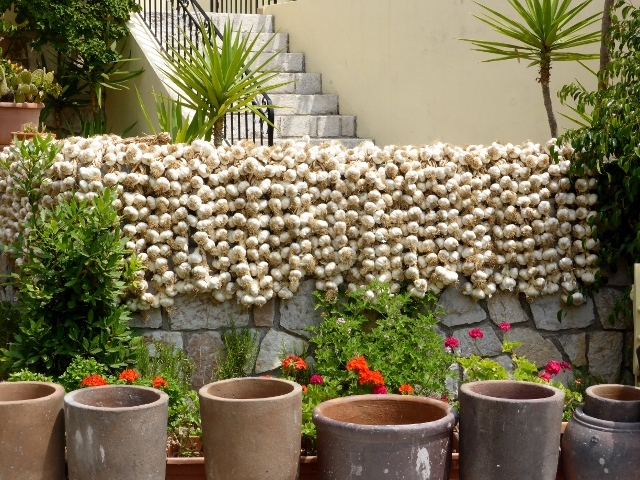 Only 30 miles from the Aeolian Islands and a charming, neo-classical town, in a slight state of ruin, there is a lot to like. The outstanding feature has to be the beaches. Surrounded by tufa, the beaches are superb. 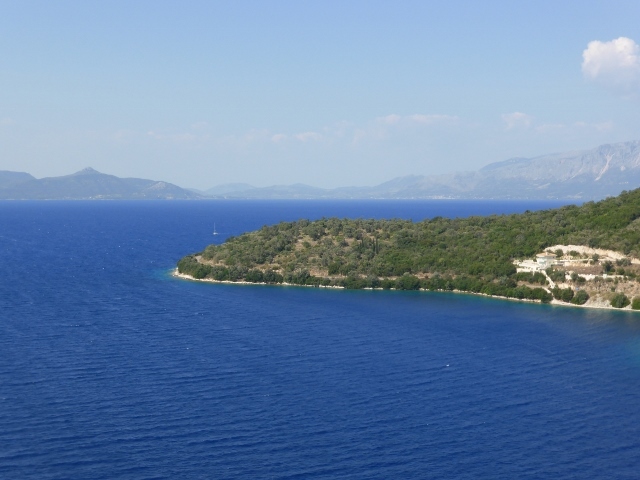 Odysseus never talks about beaches, does he? The beaches here are sensational. 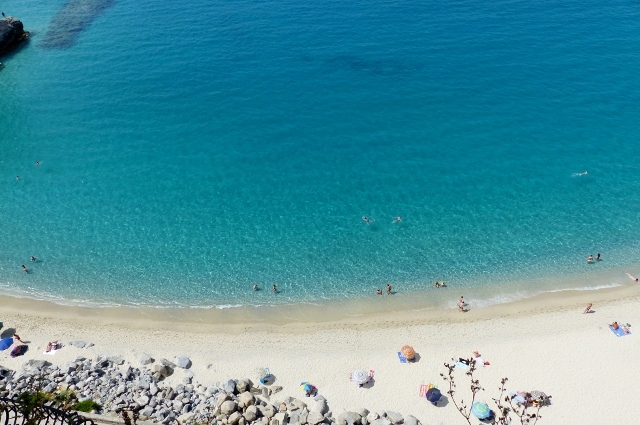 There were incredible beaches up the coast from Reggio di Calabria. I tried to get James and Frosty smiling while in the Messina Straits, but in that photo they looked liked they had seen Charybdis. They liked the beach though. On occasion, James and I think, “Wouldn’t it be nice?” and the next thing you know instead of sticking with our plan, we abandon it. 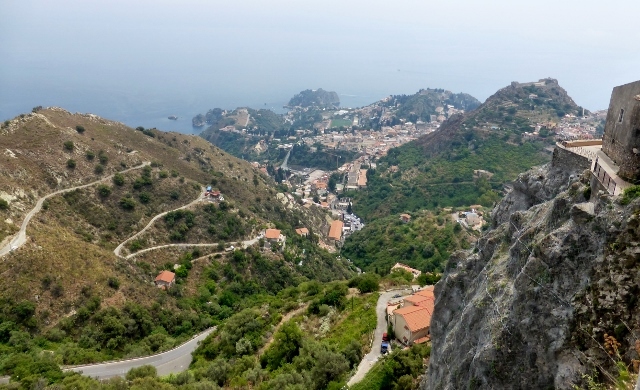 In this case, we turned left 90 degrees south and headed for Taormina. 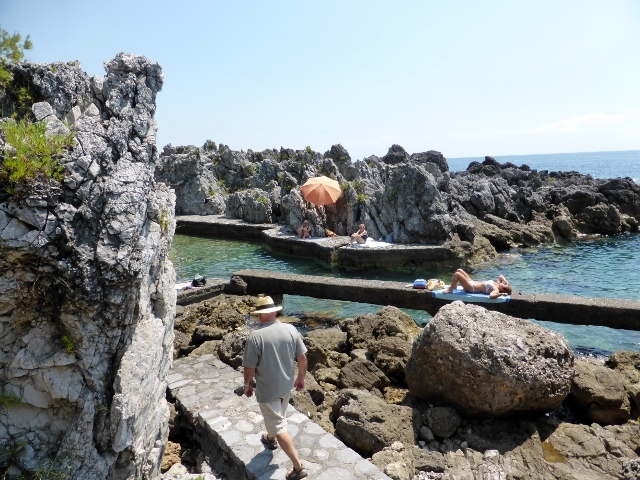 There are moorings run by George Risso ‘en vicino’ to the Taormina railway stop. This meant we could leave Mercier on a mooring and be ferried to land by the very friendly Branko and take a bus up the hill to Taormina. Perfetto! 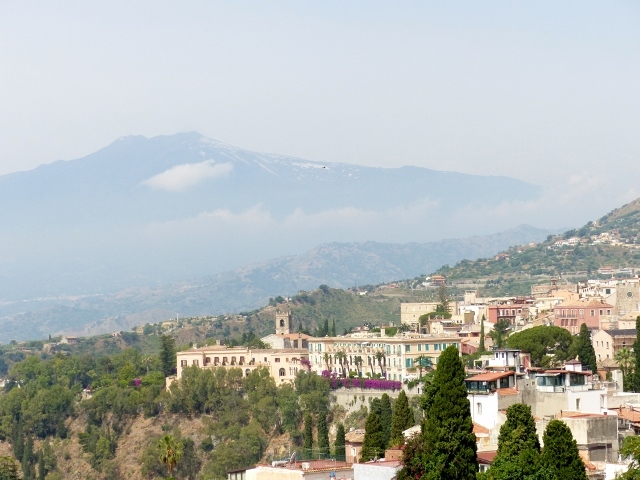 Mount Etna is our backdrop. Today she was shrouded in mist and clouds. As we are on a mooring, there is no electricity, hence no coffee. As soon as we walk through the Porto Messina arch, we head for the sumptuous Hotel Timeo and their perfect coffee. 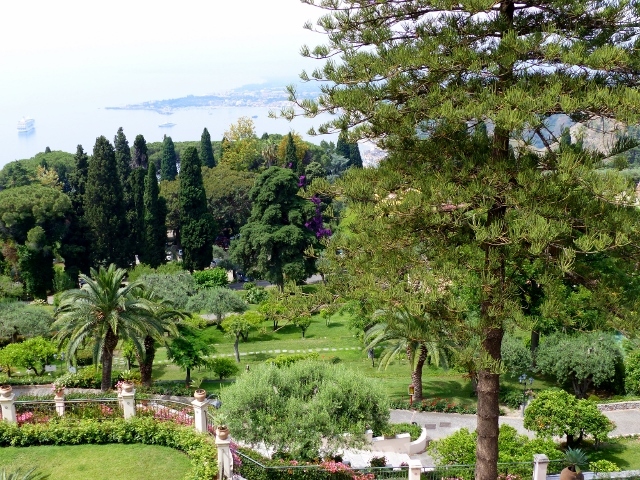 We gaze over the Botanical gardens of Taormina with the stunning Mount Etna as the back drop. 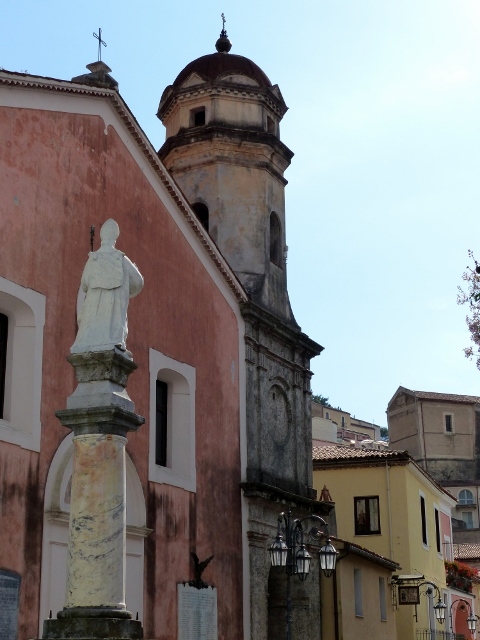 We walk through Taormina after the coffee and call into churches and shops. 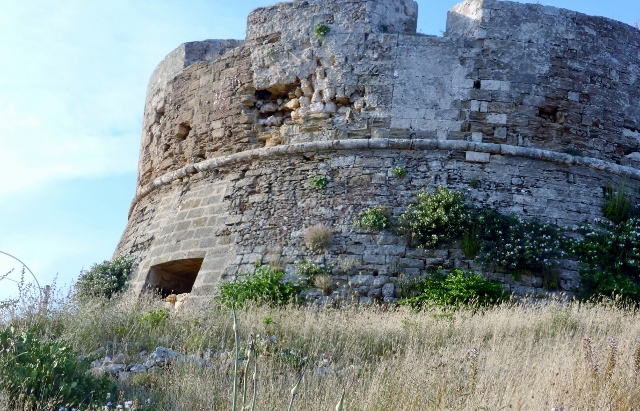 Then we jump in a cab and ride up the tortuous road to Castelmola for a visit to the castle village and lunch. Etna was completely ensconced by cloud and wispy clouds seem to be floating up to us too. The bus down the hill deposits us at the Arch again and we wait for Frosty to arrive. After Frosty arrives we arrange a quick tour of Taormina, which includes a short visit to the Greek Theatre, which is hosting a film festival but not tonight. 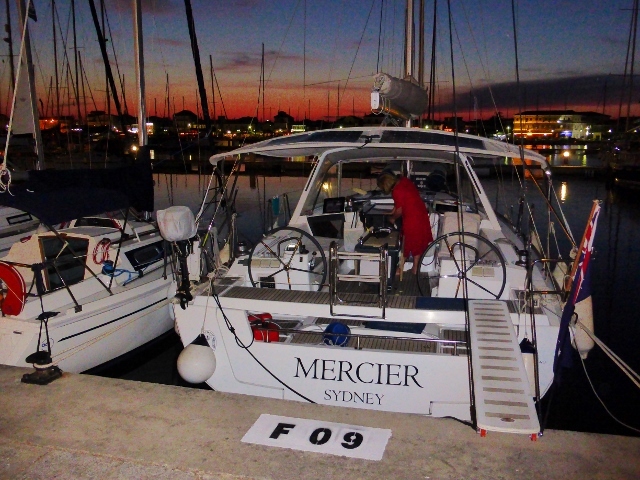 Then we head down to Mercier, move to a quiet anchorage and row ashore for dinner. Frosty’s celebratory birthday dinner was the main event. 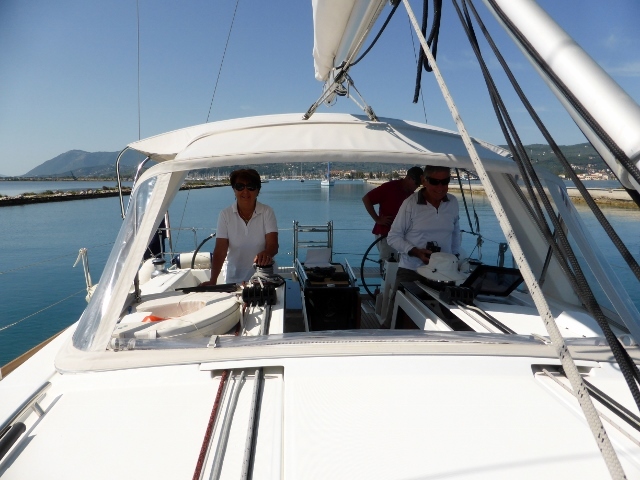 Today we have motored over to Reggio di Calabria and we found a berth in the Legale Navale. 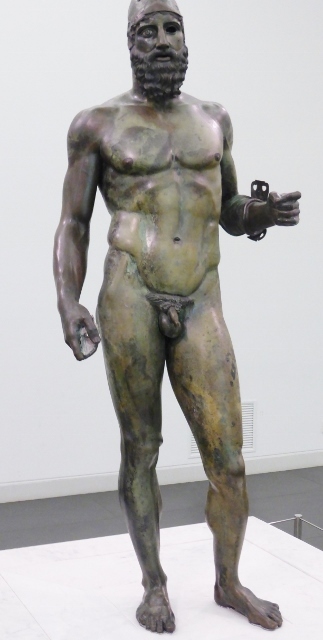 This meant we were able to visit the Riace bronzes (circa 450 BC) at the Reggio Calabria National Museum. 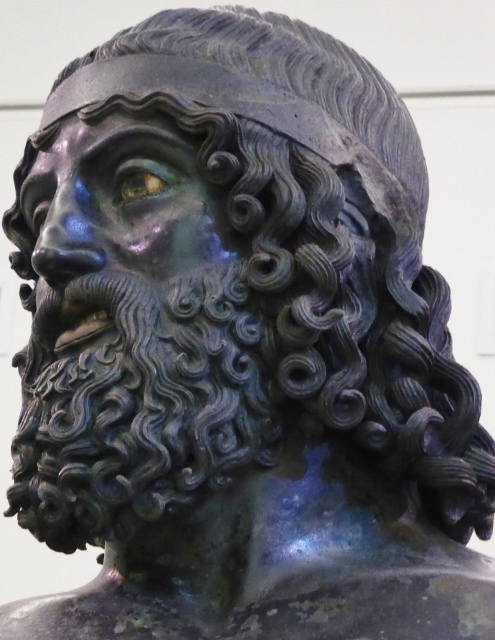 The Riace Bronzes were found by a scuba diver, vacationing in Riace, lying on the seabed and they had been there for thousands of years. There was no evidence of a ship wreck, although they may have been thrown overboard in a stormy sea. Their restoration is wonderful. It is close to miraculous. 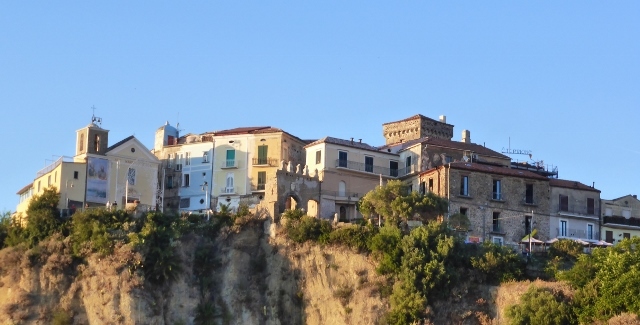 In this part of Italy, you can not be non-plussed by the beauty, the grittiness or the surprising. You can only enjoy it. 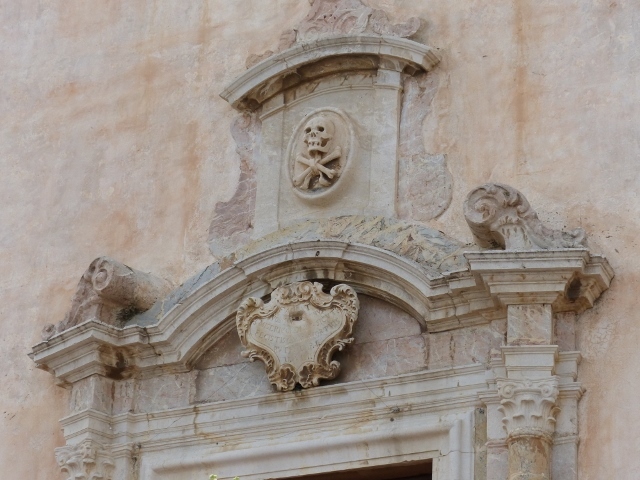 Church in Taormina, Note the skull and cross bones over the church door. 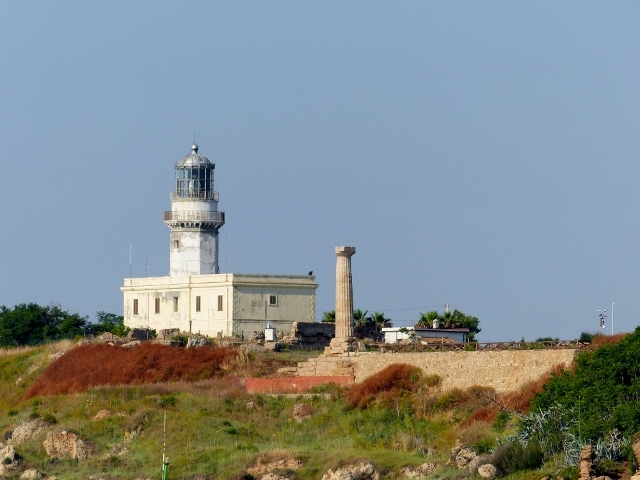 Once we had landed in the marina at Santa Maria di Leuca, the village on the very heel of Italy, we wandered around the town we had visited two years ago. By chance, as the tourist season doesn’t seem to have started, only Gelaterias were open. We have a gelato test – if the gelato is piled high out of the container, we walk by. If it is level or just slightly higher than its container, we order. The second test is pistachio ice cream must be a dusty olive green and not bright or flouro green. These two tests are fairly fool proof. Needless to say, the gelato was wonderful at Crema and Cioccolatta Gelateria and afterwards we walked down the street and noticed a medieval fort built to protect against the Saracens. The fortress is covered in beautiful caper plants, which must self seed into crevices of the hot, dry stone walls. 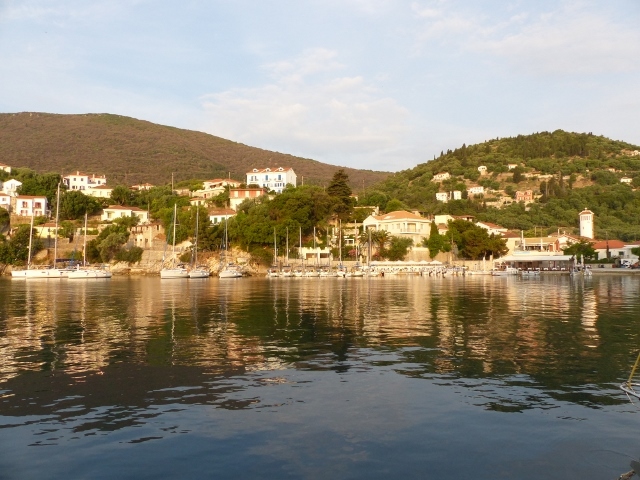 This part of the journey finds anchorages and marinas few and far between, we are sailing or motor sailing for 60 miles a day, leaving at day break and getting in late afternoon or early evenings. Two years ago, we went into the Porto Vecchio at Crotone on a Sunday. There wasn’t much open and we only saw the very gritty area near the fish markets. Yesterday, we walked up to the beautiful castle built by Carlos V and the old town, then down to the beach with beautiful sands. We commented that it didn’t look affected by tourism at all, except perhaps Italian tourism. As we were departing this morning, we saw a cruise ship come into Crotone. We realized we were doubly lucky: we weren’t there on Sunday and the Cruise ship was not in town. On our Western track, we passed the Promontorio di Capocolonna. 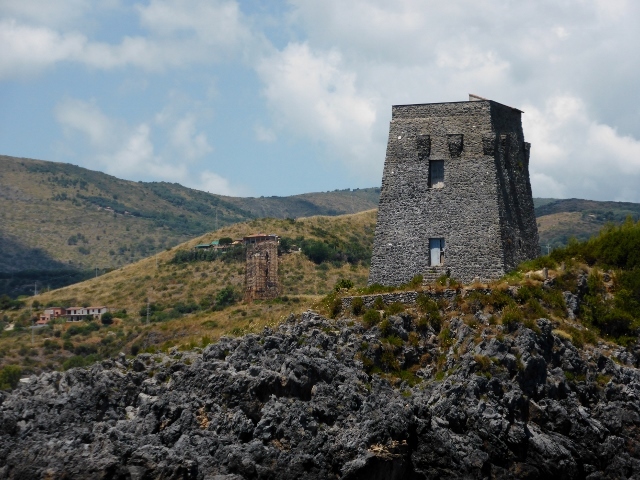 In a very small area, we see the ruins of the Temple of Hera Lacina, the Tower of Nao, a XVl century fortress, a church sanctuary and a light house. If you send Sandy and Gaila off to get a loaf of bread; you will find a loaf of bread, apple tarts and spanakopita for lunch in the bag. Add a few cucumbers, tomatoes and tzatziki and you have a wonderful lunch. 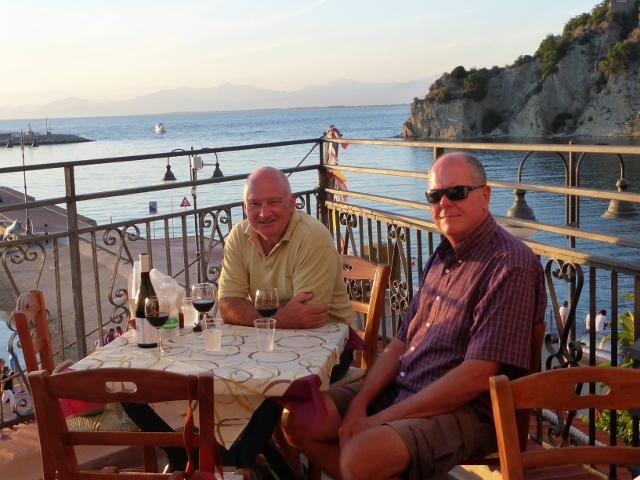 The food here in Greece has been great, although you have to be lucky with tavernas. The food has ranged from average to excellent, but we are winning. Everything is so inexpensive and the fruit and tomatoes are exquisite in flavor. The nascent wine industry is getting better and we have tried Greek bottles of wine that were surprisingly drinkable. We haven’t seen a dolphin but we have had some great sunsets, thunderheads and we did see a double rainbow. The double rainbow which is a lovely omen as our time draws to a close in Greece. 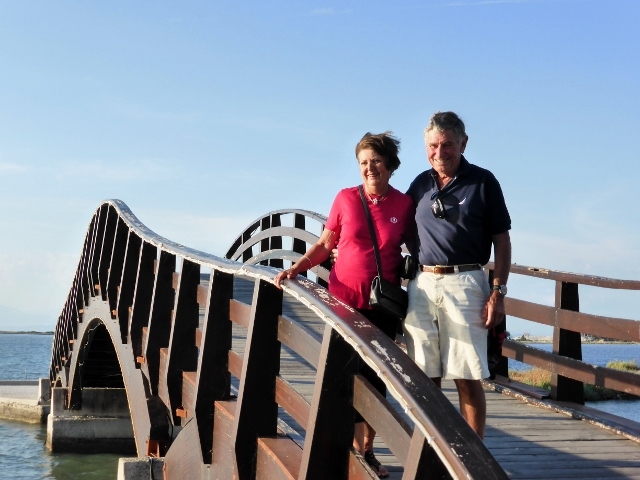 Ric and Sandy are planning to go to experience the magic of Meterora before heading back to Sydney’s chilly climes. They will probably bring the warm weather back with them. 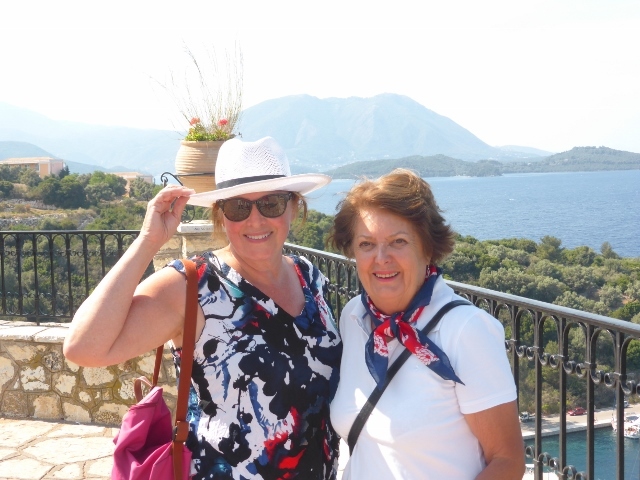 We have sailed through salt flats at Lefkas, past Cleopatra’s ignominious retreat at Preveza, had a swim at Paxos walked through alleys and into churches. 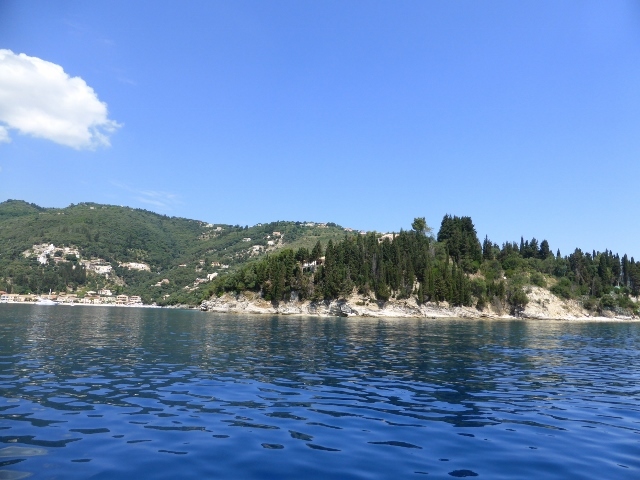 Now we are at Corfu and soon we have to leave Greece. Now there is a sad thought, where can we get Spanakopita in Sydney? Happy Birthday to my sister, Linda. Enjoy! 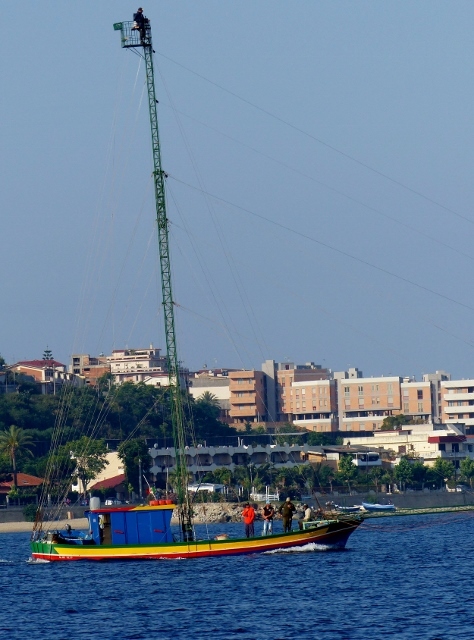 If your route constitutes sailing to windward, there may be no better place to sail/motor than the inland sea. Sailing from harbour to anchorage through this area is a dream. Why you ask? You can easily get up early and get to your next anchorage with light winds, get anchored in time for morning coffee before the wind gets fresh. Get off the boat for the afternoon sightseeing and have dinner ashore, then by about 9:00 the wind has died down and the boat is quiet for a good night’s sleep. We call it the Gentleman’s Breeze. You have plenty of time then to walk around and enjoy the sights, shop or find a bakery. If you want to sail, hopefully going south, then you have a sleep in, morning coffee, sail to a lunch spot, swim and in the early afternoon the breeze comes in and you can sail for miles under fresh breezes. 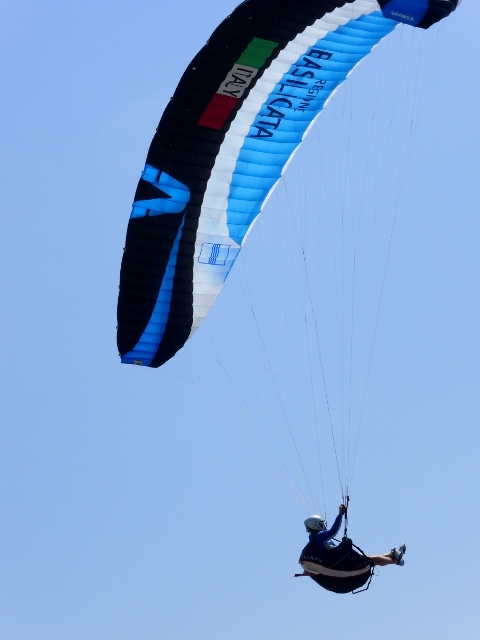 Jimbsail.info is a wonderful resource for sailors sailing in the Mediteranean and he has information about the Inland Sea of the Ionian enclosed by Kephalonia, Ithaka, Mainland Greece, Meganisi and Preveza. In all the Med, this is sailing that most reminds me of Sydney Harbour. The Inland sea is good area for novices and families. 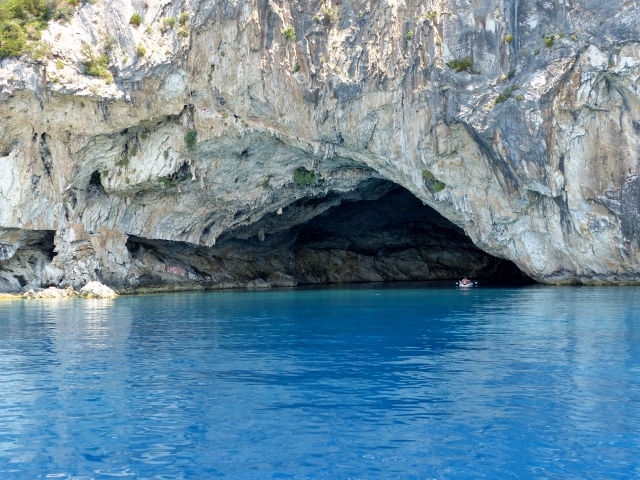 It is a great place to sail in Greece and not have to work around the Meltemi or struggle going to windward. The captain and crew on Mercier, have wooden boats in their veins. Squadron friends know Ric and Sandy have the lovely classic yacht, Rapunzel. On Ithaca, both In Vathi and Kioni, we spotted the classic wooden yacht Rubicon, and Rubincon’s owners, Lance and Charlotte. They are also members of the Cruising Association. 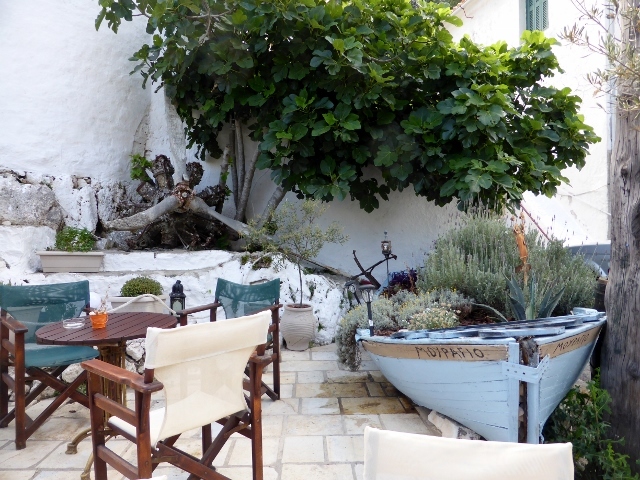 Hello quickly turned into a chat about wooden boats and their beautiful Rubicon, which they will keep in Greece. Lance calls this “resonance”, finding people with a shared interest and continuing to bump into them. 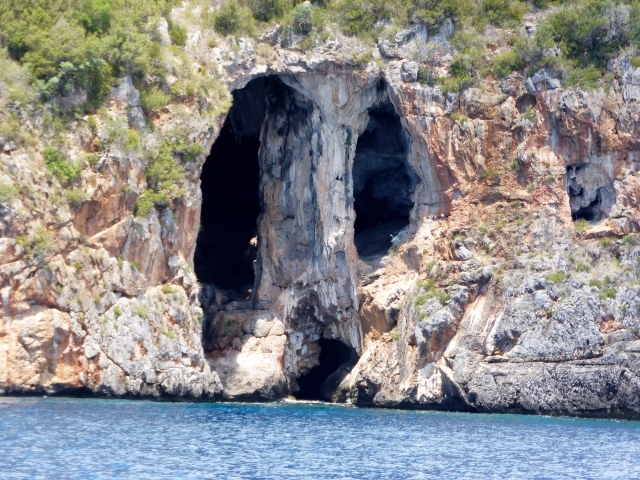 So our last few days have taken us to Vathi and Kioni on Ithaca as well as Porto Spilia, Meganissi after a swim near St Nicolas’s Cave. We are enjoying the trip, even though we are moving, but Sandy and I decided it is just the right pace. Meanwhile, fair winds to Rubicon, Charlotte and Lance. We’ll see you in Sydney.